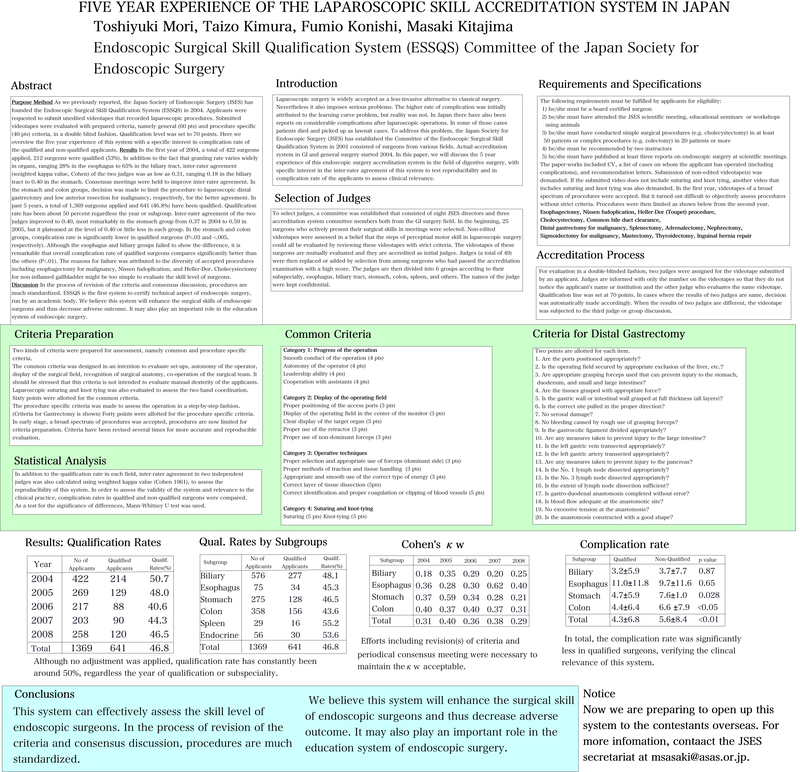 Purpose, Method As we previously reported, the Japan Society of Endoscopic Surgery (JSES) has founded the Endoscopic Surgical Skill Qualification System (ESSQS) in 2004. Applicants were requested to submit unedited videotapes that recorded laparoscopic procedures. Submitted videotapes were evaluated with prepared criteria, namely general (60 pts) and procedure specific (40 pts) criteria, in a double blind fashion by two judges. Qualification level was set to 70 points. Here we overview the five year experience of this system with a specific interest in complication rate of the qualified and non-qualified applicants. Results In the first year of 2004, a total of 422 surgeons applied, 212 surgeons were qualified (53%). In addition to the fact that the accreditation rate varies widely in organs, ranging 28% in the esophagus to 65% in the biliary tract, inter-rater agreement (weighted kappa value, Cohen) of the two judges was as low as 0.31, ranging 0.18 in the biliary tract to 0.40 in the stomach. Consensus meetings were held to improve inter-rater agreement. In the stomach and colon groups, decision was made to limit the procedure to laparoscopic distal gastrectomy and low anterior resection for malignancy, respectively, for the better agreement. In past 5 years, a total of 1,369 surgeons applied and 641 (46.8%) have been qualified. Qualification rate has been about 50 percent regardless the year or subgroup. Inter-rater agreement of the two judges improved to 0.40, most remarkably in the stomach group from 0.37 in 2004 to 0.59 in 2005, but it plateaued at the level of 0.40 or little less in each group. In the stomach and colon groups, complication rate is significantly lower in qualified surgeons (P<.03 and <.005, respectively) than in non-qualified surgeons. Although the esophagus and biliary groups failed to show the difference, it is remarkable that overall complication rate of qualified surgeons compares significantly better than the others (P<.01). The reasons for failure in the esophagus group was attributed to the diversity of accepted procedures including esophagectomy for malignancy, Nissen fudoplication, and Heller-Dor. Cholecystectomy for non-inflamed gallbladder might be too simple to evaluate the skill level of surgeons. Discussion In the process of revision of the criteria and consensus discussion, procedures are much standardized. ESSQS is the first system to certify technical aspect of endoscopic surgery, run by an academic body. We believe this system will enhance the surgical skills of endoscopic surgeons and thus decrease adverse outcome. It may also play an important role in the education system of endoscopic surgery.